For the Irish rural poor, the open fireplace of a small stone cottage was the locus of comfort and security. Suspended over the turf fire was a large, three-legged, iron cooking pot. By the nineteenth century, these vessels were almost always mass manufactured in a style that harked back to mediaeval times; they continued in use until the mid-twentieth century—this six-gallon example, from Corelish East, Grean, Co. Limerick, was purchased by the National Museum in 1965. These pots became a talisman of survival. 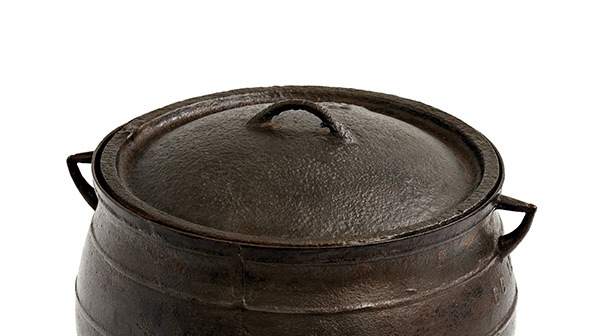 Folklorist Estyn Evans noted that during the years of the Great Hunger—the potato famine of 1845–9—victims ‘clung to the pot when all else was gone’. Famines were not rare in Ireland: there were perhaps 30 severe episodes between 1300 and 1800, including a disastrous failure of the potato crop in 1740. The sheer size of the population dependent on the potato, however—three million or so—made the arrival, in August 1845, of the potato blight fungus phytophthora infestans the worst such event in Irish history. That year, onethird of the crop was rotten and inedible; by 1847, most of the seed potatoes had been eaten by desperate people. In the first year of the famine, the Tory government of Robert Peel responded by importing £100,000 worth of Indian meal from the US and establishing a programme of public works. The Liberal administration of Lord John Russell, which took office in 1846, continued the works programme, but was reluctant to interfere with market forces. A combination of laissez-faire ideology, a ‘providential’ evangelical theology that saw the famine as God’s way of correcting the vices of the Irish and a severe economic recession in Britain greatly limited the scale and speed of the official response. While some private organisations, notably the Society of Friends (Quakers), made heroic efforts to save lives, the government refused to stop the export of food from Ireland causing extreme bitterness for decades to come. In February 1847 ideology and theology were set aside and public kitchens were established, to feed the starving without demanding work in return. In September, however, the government insisted that further relief would be supplied only at already overcrowded and insanitary workhouses. This concentration of sick and starving people undoubtedly created ideal conditions for the spread of the diseases—principally typhus and relapsing fever—that killed more people than hunger alone. Misery was piled on misery; landlords, under pressure from rising taxation and falling rents, evicted tenants at a rate that rose to 100,000 a year by 1850. Roughly one million people died (proportionally more than in any other known famine) and a similar number emigrated. Patterns of mass migration were reinforced. The decimation of the cottier class changed both the social structure and the prevailing culture—those who died or left were disproportionately Irish speaking. A new Ireland emerged from the disaster, as Catholic beef farmers took over the vacated land. The famine ended but, in these respects, it has never gone away.